With a medley of gorgeous beaches, quaint cobbled villages and stacks of natural beauty, the Algarve has long been a popular choice for summer holidays. Yet this Mediterranean gem remains a popular pick far beyond the peak season, thanks to its variety of things to see and do and a healthy 300 days of sunshine. The best time to visit Algarve, Portugal, depends on what you’re looking for in a holiday. This region boasts the best climate in the country, with long spring and summer seasons and a short, mild winter. Peak season includes the months of June to September, when the weather is hot and the resorts are packed with beach lovers looking for a dose of sun, sand and surf. However, the “out of season” months are actually some of the best, with lesser crowds, better temperatures for activities and far greener scenery. September and October are possibly two of the best months to visit the Algarve, once the height of the summer is over and temperatures are reduced - yet still pleasant in the high 20’s - resorts remain open and the countryside gets prettier. If you want a winter stay, November and December is an ideal time for a short stay when the region is cooler, although some restaurants and activities begin winding down in preparation for Christmas. January and February are traditionally the coolest months with occasional rainy days, making them slightly less popular for visiting, particularly in the lead up to spring. March and April are when flowers are in full bloom, skies are blue and the weather is pleasantly warm for wandering quaint downs and coastal walks, without the busy crowds – a perfect Easter getaway. One of the Algarve’s major draws is its exceptional coastline, crowned as one of the best in Europe it will blow you away with its lively Atlantic waters and golden swathes of sand backed by dramatic burnt-orange cliffs. The best Algarve beaches for families are without doubt Praia da Marinha, a white sandy stretch in central Algarve, Praia do Ancão, a Blue-Flag stretch with an abundance of sporting activities, and Praia do Camilo, a postcard worthy shoreline in western Algarve with regular cave tours by boat. Beyond the famous beaches also lie respected, lesser-known coastal towns, perfect for wandering when the weather is slightly cooler and the cobbles are less crowded. The former fishing village of Burgau is a delightful spot in the western Algarve, with traditional white washed houses clustered together in narrow streets, rugged cliff top paths and outcrops and a selection of restaurants. Quarteira was one of the first resort towns that became popular along the Algarve coastline, with a medley of local restaurants, bars and golf courses surrounding the beautifully kept Blue-Flag beach. Better still, this social town is nearby to Vilamoura, a horseshoe-shaped marina lined with chic bars and eateries – a perfect location for lunch or dinner. If you’re looking to stumble upon a real hidden gem, Praia Fluvial de Alcoutim is a quirky man-made beach fringed by calm river waters. The best part? You can visit this perfect picnic spot any time of year and still beat the crowds thanks to its secret status. This natural wonder is a must-visit if natural beauty is your bag. Located in Tavira, this gorgeous waterfall (literally translating as Hells Pool) is one of three in the Asseca Creek and is reached by a winding wooden staircase. Take a dip in the lagoon-like waters and admire the tranquil surroundings. If your partial to a party or two, Portugal is bursting with colourful carnivals in February – and the Algarve is no exception. Head to the scenic town of Loulé and its cosy cobbles will be kicking up an atmosphere to rival Brazil, for its Mardi Gras style events to kick off Lent. Extravagant costumes, stilt-walkers, confetti-filled streets and upbeat music will fill the town with excitement during Loulé Carnival, followed by the renowned cycling event Volta ao Algarve running from 14th – 18th February – where professionals flock to the coast for the two-wheeled event. Crowned as one of the most popular places in Europe to catch some waves, the Algarve is a fantastic surfing destination with a selection of award-winning beaches, surfing camps and schools to help you boss that board! While pulling on a wetsuit during the winter months might take some persuading, January, February and March are actually the best times to hit the beach, when the waves are on top form – Amado beach is popular for beginners with surf lessons and schools available. If you like to wine and dine, how about a weekend getaway in Silves, where you can visit the Quinta do Frances vineyard in the Odelouca River Valley. Producing over 35,000 bottles of wine a year, this pretty vineyard is a great pick if you’re visiting in the spring months of March and April. Book a tour of the winery and indulge in wine tasting and tapas as you learn about the vineyard’s story. Albufeira is probably the most popular beach resort for families in the Algarve, but there are a whole variety of resorts along this southern region that offers something for everyone, from traditional and quiet locations to lively and cosmopolitan spots. 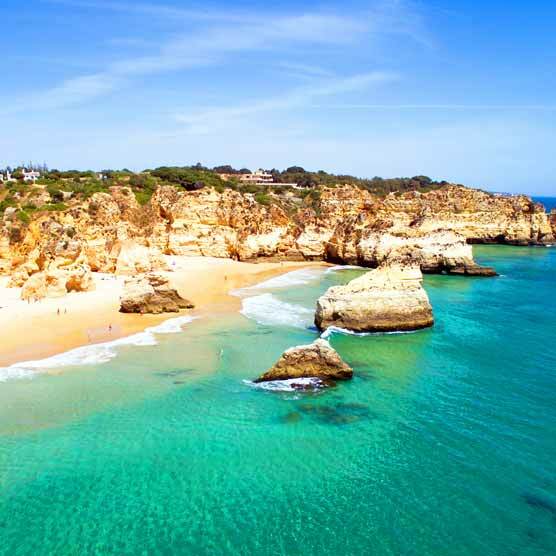 Lagos, Albufeira and Praia da Rocha are at the heart of the action, with fantastic watersports, award-winning beaches and bustling resort towns to match, meaning you’re never too far from seafront restaurants, exciting boat trips, lively bars and cultural wonders too – an all-rounder. Praia da Luz and Carvoeiro are great options if you’re travelling with children, thanks to their low-key vibes, family-friendly atmosphere and calm beaches – plus a variety of fun activities sure to keep the kids entertained. If you’re visiting this southern region for its rich history and culture, the resorts of Faro and Tavira are your best bet. You might not know it, but Tavira has made its name for being one of the prettiest towns in the Algarve, with authentic cobbled streets lined with intriguing architecture and baroque ruins. While Faro, the capital, impresses with its enchanting medieval quarter, pretty marina and sun-soaked plazas – perfect for alfresco dining at dusk.